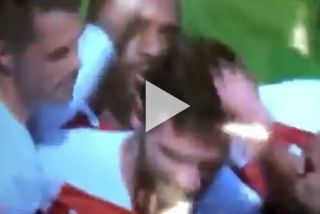 Arsenal striker Alexandre Lacazette was spotted whacking Shkodran Mustafi over the head after his goal against Cardiff City today. The German defender headed home the opener for the Gunners, and his reward was this rather excessive attack from one of his own team-mates. While it was clearly meant well, Mustafi actually seemed to think it was a little over the top from the Frenchman. Let’s hope Mustafi doesn’t score again today or he’ll end up with a head injury!